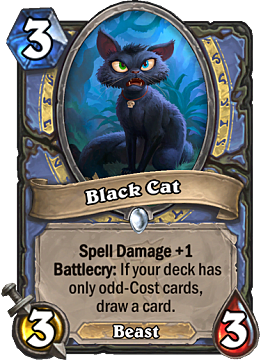 Black Cat is a mage class card and is very similar to Soot Spewer, which is currently a wild-only card. In addition to providing a bonus to spell damage, however, it also draws you a card if your deck does not contain any even-cost cards. It already has synergy with the previously revealed Baku the Mooneater, making it a particularly likely inclusion for that kind of deck. 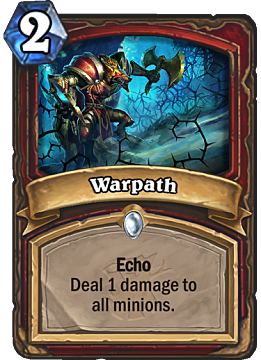 At first glance, Warpath is just a more expensive Whirlwind, yet the fact that multiple copies of it can be played on a single turn, thanks to the new Echo keyword, makes for a versatile board-clearing option which Warrior is not really known for. It also fits well alongside many existing class cards like Frothing Berserker and Rotface, among others. 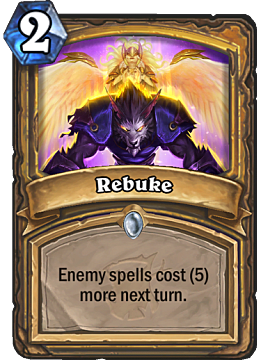 Rebuke is a Paladin-class card, and it is reminiscent of the effect from Loatheb. Since Paladin relies heavily on controlling the board, this card can be played right before the turn you expect your opponent to use either a board-clear, or hard removal. It lacks versatility, however, and therefore is useless against aggressive archetypes or decks with few spells. After a careful look, this actually is not as bad as it may seem. 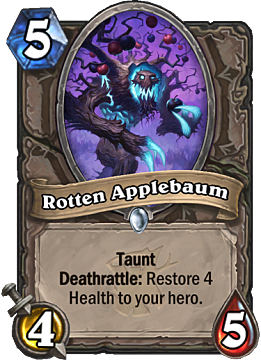 Sure, the stats are underwhelming, but if you take into consideration the fact that it has a taunt, then it has the potential of healing your hero for 9, which is a good deal. 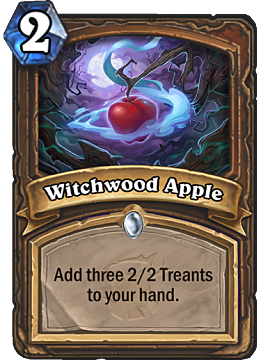 Assuming each Treant costs 2 mana, Witchwood Apple is quite poor. 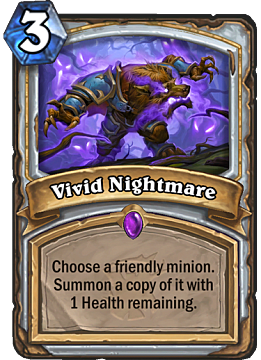 It does not complement any of the current Druid archetypes and, unless there are upcoming cards to synergize with, it might be dead upon arrival. 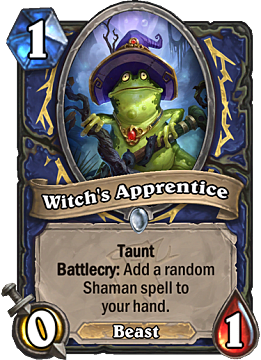 Witch's Apprentice is a Babbling Book for Shaman, except it lacks any attack value, which makes it significantly worse. It's also a beast and has taunt, but it doesn't compensate for that single shortcoming. 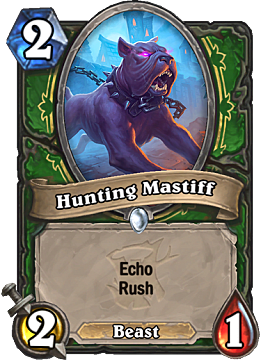 Hunting Mastiff is a Hunter-class card and, so far, the only card to contain both of the new keywords. After being played, the card creates a copy of itself thanks to Echo and can attack minions immediately via Rush. It is also a beast and therefore synergizes well with a card like Scavenging Hyena. "Excuse me, you are on fire"
Electric shock is seemingly weaker than fire, because science. 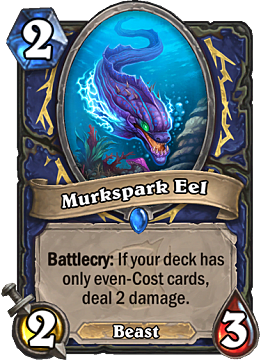 Nonetheless, Murkspark Eel is a shaman card with a decent stat distribution and, if your deck revolves around the new odd/even mechanic, it also deals 2 damage. 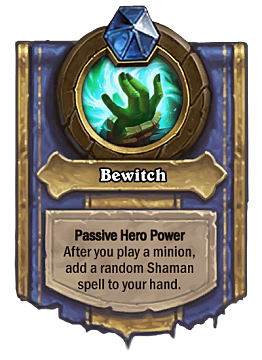 However, shaman is not exactly among the classes which benefit from the effect of Genn Greymane, a card likely played along with this one; perhaps further cards in the set might incentivize the creation of such a deck. 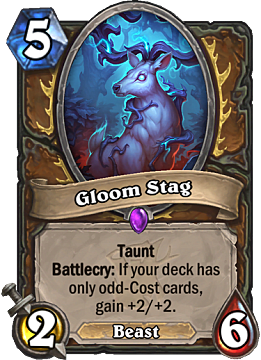 Initially a powerful-looking card, Gloom Stag is a 4/8 beast with taunt for 5 mana, if your deck meets the condition of only containing odd-cost cards. This means it is a slightly better Nesting Roc, and that card doesn't see any constructed play. Moreover, it is susceptible to silence effects, which are quite prevalent in the current meta and are likely to remain as such even after the release of the expansion. 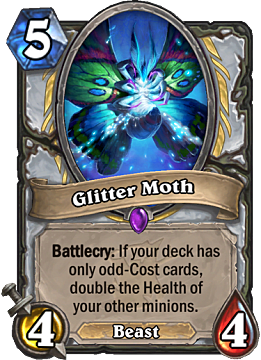 Glitter Moth is another one of those cards that works in tandem with Baku the Mooneater. As a class, Priest can benefit from an improved hero power, especially if minions have more health to begin with. This card definitely has potential. 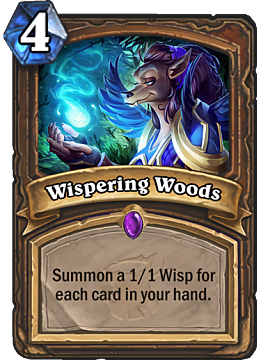 There isn't much to say about Wispering Woods. It's not a bad card, but it doesn't do anything revolutionary or exciting, either. If played while having another 7 cards in hand, it does create a powerful board presence, especially if supplemented with buffs. How good this card will actually be remains to be seen. 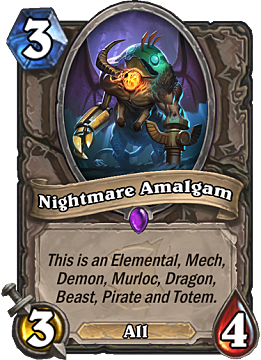 Nightmare Amalgam does what no other card in hearthstone has ever done, as it basically has synergy with any cards that represent a particular tribe/type. It doesn't have any special abilities, but the stat distribution makes it a great card in its own right. 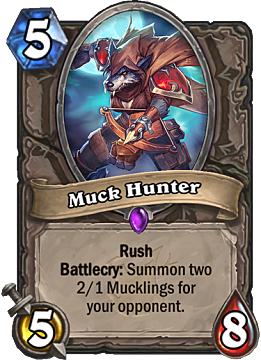 Muck Hunter has incredible stats for its cost, but it does have a significant drawback. If you can immediately clear the summoned Mucklings, however, then this is a really, really good card. Just don't get your hopes up about getting this from Firelands Portal (like I did for a brief moment), because One Night in Karazhan is rotating out. 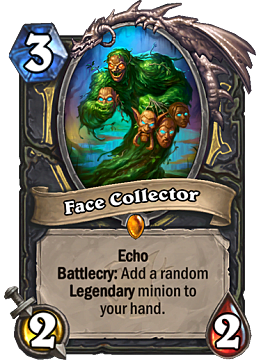 Face Collector is a legendary Rogue class-card with the new Echo keyword attached to it. Despite its cost, it is actually a late-game card. Ideally, you would play it on turn 9 and add 3 legendary cards to your hand in the process. This is an unusual Rogue card, as it doesn't quite fit into any of the existing class archetypes. Practical experimentation will be required to properly evaluate this card. 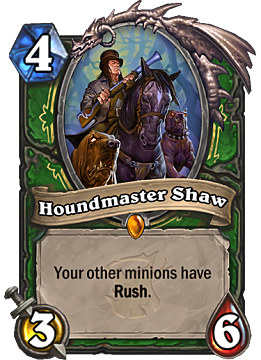 At its worst, Houndmaster Shaw is a minion with a really good stat distribution, and 6 health makes him difficult to deal with right away, which means that your other minions are likely to trade more efficiently on turn 5 thanks to having Rush. 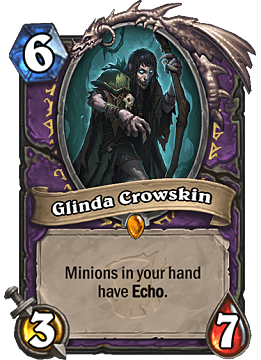 Glinda Crowskin is a Warlock-class card with underwhelming stats. 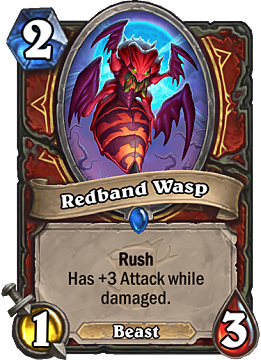 Its ability, however, is quite powerful and can provide a huge amount of value in the late game. Though it begs a question: Does Warlock need all that? 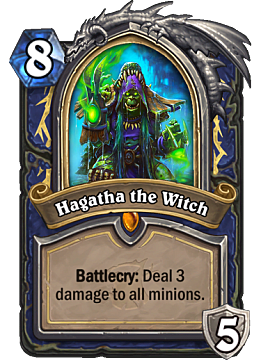 Hagatha the Witch will be the only hero card The Witchwood expansion will introduce, and it's for Shaman. Once played, it provides an immediate AoE (Area-of-Effect) comparable to Warlock's Hellfire, and changes your current hero power to Bewitch, which can add a lot of value in the later stages of a match. This card is nuts -- there is no better way of putting it. 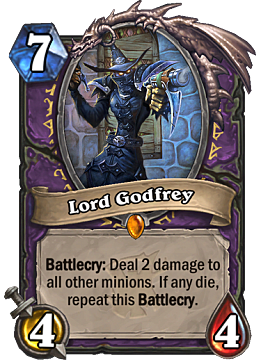 Lord Godfrey is a board-clear which Warlock doesn't lack, yet it completely blows any of the existing options away. Its battlecry is, in essence, an amplified Defile, and it is much easier to set up. In addition, it doesn't damage your hero or itself, which means it will completely clear most, if not all, board states and create a favorable board presence with a reasonable 4/4 body. This card will be a must for any control-style Warlock deck. Are you pumped for the new expansion? Stay tuned to GameSkinny for news on hearthstone cards, game modes, guides, and other extras.